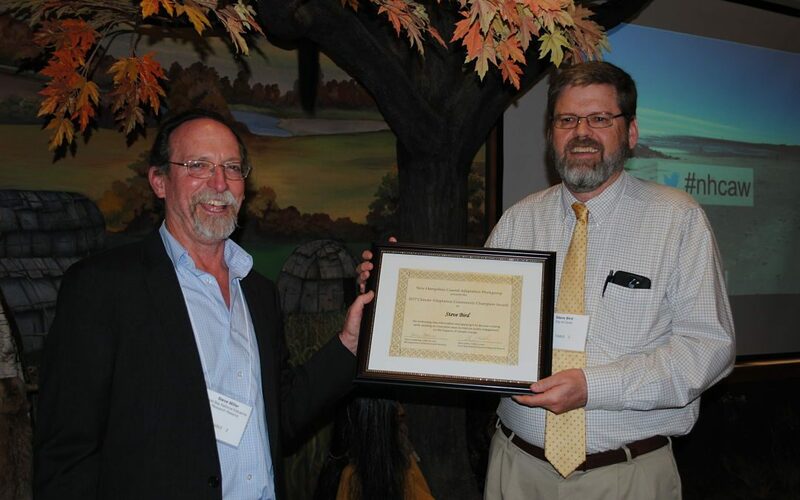 Pictured Above: Steve Miller (left), CAW Co-Chair / Great Bay National Estuarine Research Reserve, presented Steve Bird (Right), Dover City Planner, with CAW’s 2017 Climate Adaptation Award at the Coastal Climate Summit on May 25, 2017. The NH Coastal Adaptation Workgroup (CAW) was pleased to present the 2017 Climate Adaptation Champion Award to Steve Bird, Dover City Planner, at the 2017 Coastal Climate Summit on May 25, 2017 in Greenland, NH. Now in its 3rd year, CAW’s Climate Adaptation Champion Award recognizes local climate adaptation leaders who, often in conjunction with CAW members, put climate-related research and outreach to work in the communities where they live, work, and play. The unanimous choice of the award selection committee, Steve Bird was recognized for serving the City of Dover, NH in a professional capacity and for his exemplary efforts to integrate climate-related information into local decision-making. Since coming on board as Dover’s City Planner in 1997, Bird has actively been involved in, if not spearheading, a number of the City’s climate adaptation projects, including the adoption of more stringent floodplain regulations, the completion of a sea-level rise vulnerability assessment, the consideration of sea-level rise projections in Cocheco Waterfront Development plans, and the ongoing development of a climate adaptation chapter for the City’s existing master plan. Bird also served as a member of the Coastal Risk and Hazards Commission, which issued recommendations aimed at state agencies and coastal municipalities focused on improving science-based understanding of coastal flood risks, completing detailed assessments of our vulnerabilities, and implementing actions that protect and adapt our built landscape, economy, natural resources, and cultural and historic heritage. Bird’s many contributions are often voluntary and above and beyond his official responsibilities. Always on the look-out for new information and how it can be used to inform local decision-making, Bird’s nomination notes that he is constantly evaluating what other climate-resiliency projects are happening in surrounding communities and how they could potentially be applied to influence change in the City of Dover. He embraces innovative ways to increase public awareness about climate change risk and adaptation opportunities and has worked on several projects to expand the City’s transparency and improve processes to engage the public in the identification of climate impacts. Finally, while Bird’s position as City Planner may limit the extent to which he can directly engage with neighboring communities, it is clear that his resilience planning efforts already do and will continue to serve as a model for surrounding communities. As a result, Bird is frequently asked and consistently volunteers to share Dover’s climate adaptation experience with various boards and commissions within the City, as well as with audiences at workshops and conferences within the greater region. Please join us in congratulating Steve for this well-deserved accomplishment! CAW’s 2017 Climate Adaptation Champion Award Winner, Steve Bird, was also featured on Fosters.com.